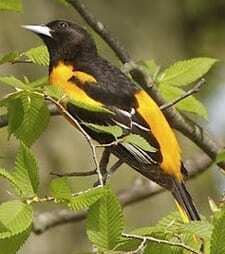 The rich, whistling song of the Baltimore Oriole, echoing from treetops near homes and parks, is a sweet herald of spring in eastern North America. Look way up to find these singers: the male’s brilliant orange plumage blazes from high branches like a torch. Nearby, you might spot the female weaving her remarkable hanging nest from slender fibers. Fond of fruit and nectar as well as insects, Baltimore Orioles are easily lured to backyard feeders.